The aforementioned licensing is well documented in the NJAC and requires a potential home inspector to take approved training from an authorized training service in accordance with the Standard of Practice as detailed by the American Society of Home Inspectors (ASHI) as stated within the NJAC. The candidate is also required to perform forty hours of field work and take a national home inspection test. The candidate must also apply to the state of New Jersey to obtain a home inspection license number. Regal Home Inspections, LLC is licensed with NJ State License number 24GI00125100. A license may also be obtained if they were in the business prior to May 29, 2003 or if they performed over 200 inspections as an apprentice inspector while working for a licensed inspector. Starting one’s own inspection business, like Regal Home Inspections, LLC, requires further documentation such as proof of a legal business, Federal Tax information, proof of state regulated minimum insurance (types of coverage and amounts) and other pertinent information must be provided. Ask your home inspector to provide a copy of their license, proof of insurance, etc. Every inspector must have their state issued license on their person when they are performing a home inspection. Contrary to popular belief, a NJAC home inspection IS NOT a “to code” inspection. An inspector will not “Determine compliance with codes, regulations and/or ordinances.” according to the NJAC. Please note that this description below is an overview and not intended to cover or address every detail of the NJAC. Within 24 hours of setting an appointment (scheduling a date) the inspector must provide the client with a written contract. The contract can be emailed of course but the NJAC cites exactly what the contract must address. A few examples include the date/time of the inspection and the cost. Regal Home Inspections, LLC’s Inspection Agreement is comprehensive and asks for the client’s signature. On a side note, after it is signed, the home inspection company must retain a copy of the signed agreement for five years. The inspector must provide you with a Home Inspection Report. Click Here For Sample Report Regal Home Inspection, LLC’s reports are very thorough and comprehensive. We use photographs and written text to document our findings. Many photographs are captioned in addition to the detailed explanation. I use arrows and circles to additionally highlight areas of concern or interest in a photograph. One should not rush through the reporting process and quickly hand you a report as they are getting into their car. For every hour I spend on site doing my visual inspection I spend at least another hour preparing the report. Some inspectors simply use a checklist. While technically legal, it does not provide a detailed account of the findings. Some inspectors prepare their inspection report on site. I do not believe that they are providing you with the best service possible. The report is the product you are buying. Insist on a thorough report with a detailed section as well as a Summary Section. At the request of an attorney, early in my inspection career, I was asked to include a Summary Section. This attorney didn’t want to have to read the entire report to find the Material (aka Major) Defects or Safety items. My report contains a Summary Section that re-lists the Material Defects and Safety items that were found during the inspection. The main body of the report has all the detail, photos, maintenance suggestions, serial numbers as well as those important items that are mentioned again, in summary form, in the Summary Section. Recreational elements aren’t listed including spas, swing sets, etc. There are items that are not part of a home inspection, both inside and out. Areas excluded include pools, sheds, etc. The report should state the significance of the findings. Specifically, were there any “Material Defects” (aka Major Defects) found? And if there were, “Provide recommendation…to repair, replace or monitor a system or component or to obtain examination and analysis by a qualified professional, tradesman… without [the home inspector] determining the methods or costs of corrections”. This leads us to the core of the discussion and often a bone of contention between inspectors and real estate agents, buyers and sellers. What is a Material Defect? The following definition is an exact quote from the New Jersey Administrative Code Chapter 40, Subchapter 15. As we read this important definition, what are some of its key elements? The aspects are limited to the Systems and Components as mentioned in 3) a. – i. above. They are “readily ascertainable.” Remember, this is a visual (and non-destructive) inspection. The inspector is usually hired by the prospective buyer and the prospective buyer does not yet own the house. The inspector does not cut holes in finished basement walls to see if the foundation behind it is sealed, dry and well insulated. The home inspector IS NOT even required to move furniture or storage boxes if these items are prohibiting the inspector from accessing one of the systems or components. Ascertain means to find out or to learn with certainty. Home inspectors should not guess. So the condition or situation must be easily (readily) learned with certainty (ascertained) during the inspection. “Substantially affects”. Substantially is defined as, “considerable in quantity, significantly large”. “Affect” is defined as “to produce a material influence upon or alteration in”. Does any matter associated with a system or component have a significantly large influence upon the system or component so that it causes a problem with the value, habitability or safety of the dwelling? This is where the home inspector should apply their training. Let’s look at an example. A “beam” refers to a main structural, element supported at its end points usually by the foundation wall and mid span by columns. It could be a large piece of wood or a steel I-beam. A “joist” is a smaller structural member that often rests on top of a beam (perpendicular to the beam) and it is the structural platform for the floor of a house. A beam should never be notched, cut or have any holes in it. A joist, within reason, can have holes and/or notches. A hole or notch in a beam is a material defect. A hole or notch in a joist may, or may not be a material defect. A notched beam affects the habitability of the dwelling. It needs repair. It is not the inspector’s responsibility to say “the beam will break if you dance on the floor above.” or “a strong wind will cause the house to collapse”. A beam should never be notched! This situation needs to be analyzed by an architect or structural engineer and repaired by a qualified technician or tradesman as that expert deems necessary. Here’s another that causes angst. A typical forced hot air furnace may have a useful life of 10 – 15 years. In this example, the home being inspected has a forced hot air furnace that is 25 years old. The furnace is part of the HVAC system and it is definitely an element of the home that is inspected. Let’s assume the furnace works. It heats the house but it is 10 years past its useful life. The inspector needs to state the facts; A) The furnace is 25 years old. B) Furnaces typically last 10 – 15 years. C) This furnace is past its expected lifespan. It could stop running any day or it may continue to provide heat for years to come. You can’t tell what may happen during the course of a brief furnace inspection. They should, at least, provide information so the buyer can make an informed decision. 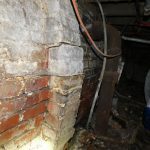 The inspector should state the facts and advise the buyer to seek the services of a furnace expert for further analysis. If the buyer (client) wants to negotiate with the seller, prior to closing, for a new furnace that is their option. The age of the furnace may have been part of the seller’s disclosure and a new furnace is already factored into the asking price of the house. That’s not for the inspector to get involved with. Let’s consider some examples. Those that I think have obvious answers are not answered (like #3 and #5). A hole in the roof is a material defect. A furnace that is leaking carbon monoxide gas into the house is a material defect. Is a closet door that sticks a material defect? If the pump in the hot tub in the back yard isn’t working, is that a material defect? Wallpaper is peeling in the kitchen. Is that a material defect? If the cause is a hole in the exterior wall that is allowing moisture to enter the wall it very well may be. If the wall paper is peeling because it wasn’t installed with the proper wall paper glue, it is not. A kitchen floor tile is cracked. Is this a material defect? If the tile is cracked because someone dropped a hammer on it then no, it is not a material defect. If the tile is cracked because the floor and beam beneath it are falling, then it’s an indication of a material defect elsewhere. You have bigger problems. A broken electrical outlet above the bathroom sink? Is this a material defect? Does this pose a safety issue for the occupants? Yes, it is a shock hazard. How about a crack in the sidewalk or a railing that is missing on the front porch? Are either or both of these material defects? They may, or may not be. It depends on the details of the situations and herein hide the challenges for inspectors. Your inspector shouldn’t be an alarmist. They can point out items that are not material defects in the interest of helping the buyer understand maintenance issues or things that might require maintenance in the near or distant future. They should stay focused on those items that NJAC requires; System and Component Descriptions and Material Defects. An inspector may provide additional services, but please be aware that some services also require their own licensure or certification and some do not. As an example, NJ Department of Environmental Protection (NJ-DEP) requires certification to set and collect devices for a radon tests. As of this writing, New Jersey does not require regulated certification or licensing to collect samples for lead paint, allergens, mold or conduct indoor air quality tests. The inspector should be familiar with the sample collection procedures. For all of these the inspector is facilitating the test by collecting the sample(s) and sending it (them) to a licensed laboratory in the state or elsewhere (but licensed by the state) for analysis and reporting. Often times the inspector can help you understand the findings of the report. 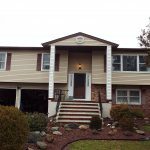 The home inspection professional must be licensed and insured in NJ. A contract must be tendered in a timely manner so the client (usually the buyer) and their lawyer have a chance to review the agreement. The inspection must produce a written report. The report must include a description of the aforementioned Systems and Components. The report must include an accounting of any Material Defects found, implications of those defects, if not self-evident, and recommendations (bring in an expert, etc.). Understanding the intended scope of a home inspection is important and it is the responsibility of the home inspector to set those expectations such as the systems and components to be inspected as listed earlier and that this is neither a “to code” inspection nor an inspection for cosmetic blemishes. Regal Home Inspections, LLC starts every inspection with the presentation of a folio of information for the client. That folio includes general information but also includes a written introduction to the inspection. I present an initial overview of the main elements detailed in this article; Laws that govern the inspection process, areas that will be inspected and more. I would appreciate your comments about this article. Please email your comments to frank07722@gmail.com or you can call on 908 902 2590.